TAKING HYDRATION TO ANOTHER LEVEL, WAY BEYOND SPORT! Quality And Style Meets Function! Made with premium grade, lightweight stainless steel with double walls for 12-hour insulation and a silicon leak-proof seal on the wide. Would You Like A Hot Or Cold Drink…? Add fruit slices to your water, chill it or juice by adding ice through the wide mouth or simply pop the half-filled bottle in your freezer. The double-wall construction ensures 12 Hours temperature maintenance without any sweating on the bottle’s exterior. The Design With Your Health & Safety At Heart! Unlike cheap bottles, It is rust-free and stain-free, without any BPA material or toxins; which preserves the safety of your drink while preventing metallic aftertaste. Built To Serve, Impress And Satisfy! 950ml (32oz) PREMIUM QUALITY STAINLESS STEEL bottle which is free of BPA materials, chemical toxins or metallic aftertaste transfer keeps you safely hydrated throughout any activity. WIDE-MOUTH for easy refilling or adding ice and fruits to your water without causing any clogging when drinking, including a leak-free, food grade silicon seal to prevent accidental spills. 12 HOUR DOUBLE WALL INSULATION maintains hot or cold temperature of contents for a full day, making the LifeSky Sports Water Bottle ideal for carrying a wide variety of beverages. DURABLE construction and re-usability makes the LifeSky Sports Water Bottle an Eco-friendly choice which reduces the need to use disposable plastic bottles that only wind up polluting the environment. 100% FREE GUARANTEE: one year warrant make no more worry about the quality and risk. 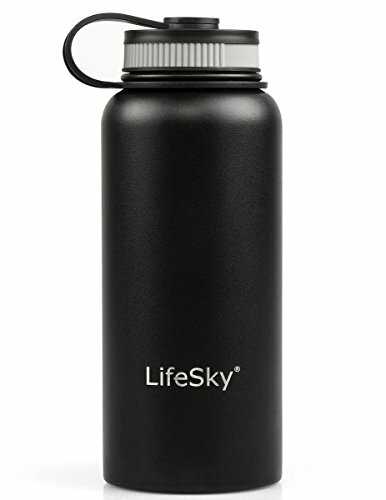 Order the LifeSky bottle Your purchase will be a 100% money-back guarantee. Don’t hesitate, Click the orange button Add to Cart to order Now!